The idea of life in the machine has been present for decades in the history of technology and biological modelling1 . Some basic questions, such as whether a human-made machine can be brought to life, can be considered thousands of years old. The biological modellers of our times ask a more modest question: “Can we reproduce the basic features of biological organisms by machines, specifically by computers?” Among the first to investigate this was the mathematician John von Neumann, one of the founders of electronic computing2 . The subject of von Neumann’s research was a basic characteristic of living organisms: self-replication. He proved that a machine, in particular an appropriately constructed automaton, could also be capable of self-replication3. During his investigations he created a mathematical structure which became the antecedent of cellular automata machines. Cellular automata have inspired many scientific and art projects – among them the Corpora InSi(gh)te project. The essence of cellular automata is that many constituent elements – automaton units – are linked together so that the state of each unit is an input for connected, adjacent units. In choosing the name “cellular automata” von Neumann was referring to a similarity to biological organisation – to cells. Indeed these automata are used nowadays for modelling biological cells4 (and in another sense of “cell”, for modelling the cells of bees’ and wasps’ nests5 ), but more generally they have become broadly applied tools for spatial modelling in nearly all areas of the natural sciences6. One of the keys to the concept’s applicability is that the simultaneous operation of multiple elements can be studied; another is that each unit only has local connections, and therefore the system operates with no global control. Consequently cellular automata and related modelling systems are suitable tools for studying self-organisation7 . The Corpora Project also exhibits a self-organising process. The creature that is brought to life – let us call it the Corporant – consists of elementary building units, called modules8 . Each module has a well-defined set of rules for birth, ageing and death, which specifies the environment-dependence of these processes. An important feature is that, as with a cellular automata system, the modules can interact, and only local interactions are permitted. A module can influence another module only if it is within a certain distance. In the three-dimensional visualisation, modules are represented by points, and connections are indicated by edges. Thus a spatial network is created which is continuously changing due to birth and death events, and which can reshape itself in response to the environment – e.g. to sunlight. To what extent is a creature like this similar to a living organism? As regards its appearance there is not much resemblance, but in its essence it is quite similar. Let us begin by stating that architecture and design have always readily employed natural forms. Traditionally these forms have been taken ready-made from nature. If we look at the plant motifs in the Hungarian Pavilion in Venice, for example, the relationship between the biological and the human-made form is evident. In contrast, the Corporant is “organic”: not in the sense of imitating the form of any biological organism, but rather in the way it reflects the process of development. The relationship between the “ready-made” pattern and the pattern-generating process is a recurrent and thought-provoking question in biology9 . 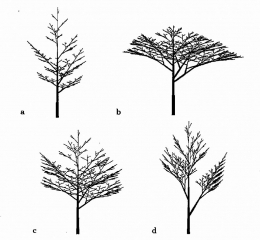 It was at the beginning of the 1980s – relatively late in the history of morphological research – when the plant morphologist Adrian Bell proposed a paradigm shift in the study of biological forms10 . He pointed out that traditional morphology aims to describe already completed patterns, yet the study of the rules of pattern formation ought to be at least as important. With his colleagues he opened a new direction of research, dynamic morphology, which focuses on the generative process. Their work had important antecedents in developmental biology and in the study of computer algorithms. The Hungarian biologist Aristid Lindenmayer11 founded a scientific school which sought to develop methods for the algorithmisation of spatial developmental processes. Through introducing his L-systems, he provided a method in which instructions are simultaneously processed in multiple units, with growth and development thus able to progress in parallel, and in multiple locations12 . The need to find instructions underlying a developmental process is reasonable, because the genome encodes a set of production rules instead of the end product. In the search for causes, it is vital to understand the genesis of the form. The generative rules can change through mutations and, in response to environmental selection effects, forms can evolve across generations. From a practical standpoint, it is important for the breeder to understand the effect of genetic changes on the morphology. 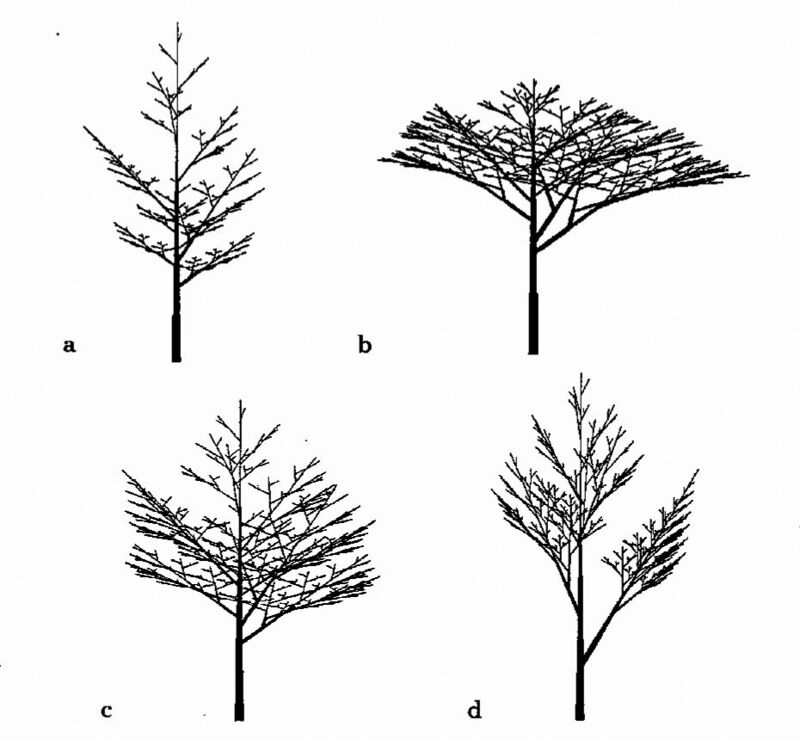 Figure 1 shows trees modelled with an L-system to demonstrate that a small change in the generative rules can produce a visible difference in the generated form. 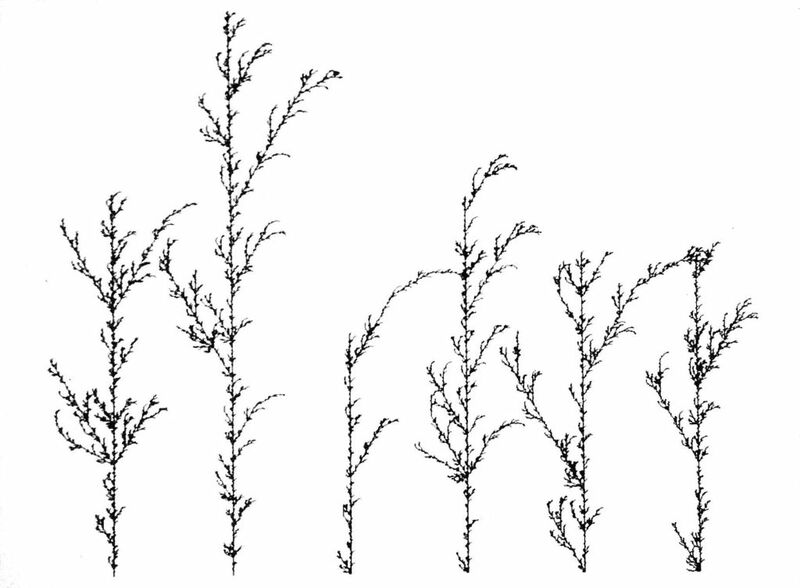 Figure 1 – Prusinkiewicz, P. and Lindenmayer A.: The Algorithmic Beauty of Plants (Springer Verlag, Berlin, 1990). http://algorithmicbotany.org/. Fig. 2.6. The Corporant is lifelike in a few important respects: it is  modular,  self-organised, and  environment-dependent. Modularity – the organisation of structures using discreet, potentially repetitive elements – is widespread in the living world at nearly every organisational level. At the lowest, molecular level of organisation the modularity of the genome can be observed. As we move up through the hierarchy, we can find modular structures at the levels of cells, tissues, organs and organisms. At the supra-individual level, modularity occurs in some structures built by animal colonies – for example in the nests of bees or wasps. Biology also uses the term “architecture”. The architecture of an organism or other biological object is defined by listing its components and specifying the geometry of their arrangement in space. 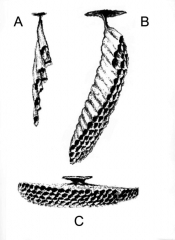 In a wasps’ nest, for example, the components are hexagonal cells, and the geometry of their arrangement can vary according to the generative rules of nest-building in a given species (Fig. 2). 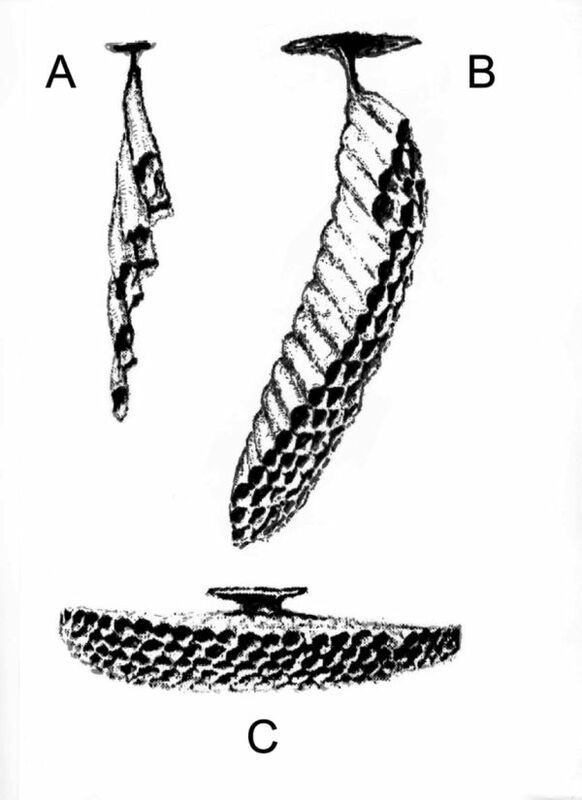 Figure 2 – Illustration created by Gyula Július on the base of the following source: Evans, H. E. and West-Eberhard, M. J.: The Wasps (The University of Michigan Press, Ann Arbor, 1970). I. Karsai and Zs. Pénzes, reproduce the figure as Fig. 1 in Nest Shapes in Paper Wasps: Can the Variability of Forms be Deduced from the Same Construction Algorithm? (Proc. R. Soc. Lond. B. 256, pp 1261-1268, 1998). Modularity is easiest to demonstrate at the level of the individual organism, as this is what we have the most direct experience of. Not every organism is modular: multicellular organisms can be divided by body structure into two large groups: unitary and modular organisms13 . Let us take the human species as an example of the former, and any tree species as an example of the latter. The basic body plan of a human being is strictly determined: each individual has two eyes, one nose and two hands. Variations are possible, but are subject to rigorous selection. In the process of ontogenesis, there is a clear endpoint: the fully developed organism. After this state is achieved, development ceases for the most part, and only smaller modifications are possible, some of which are environment-dependent. The most significant and decisive part of development occurs in isolation from the external environment – inside the uterus. In contrast, a tree is a modular organism. The number of its “organs” – its branches, leaves and roots for example – is indefinite. Ontogeny is open: it does not have a predetermined final state (Fig. 3). We can never say that a tree is “finished”. Only the early stage of morphogenesis occurs in isolation: inside the seed. Most of the developmental process takes place in the open, in continuous interaction with the environment. Therefore the form is constantly tested against the environment at every stage of growth, and can modify and adjust to external conditions (Fig. 4). For example, those branches that have become costly (i.e. sinks of energy) are disposable, resources can be allocated into branches with relatively high energy gain, and thus those parts of the canopy which have better access to light can grow preferentially. If the environment changes – for example, if a neighbouring tree falls down – the extra light can be utilised by reorganising the canopy through the birth and death of modules. Figure 3 – Illustration created by Katalina Erika Pásztor on the base of the following source: Holdrege, C.: The Forming Tree (http://www.natureinstitute.org/pub/ic/ic14/trees.htm. Fig. 1, 2005). Figure 4 – Holdrege, C.: The Forming Tree (http://www.natureinstitute.org/pub/ic/ic14/trees.htm. Fig. 4, 2005). The key, therefore, is interaction with the environment and plasticity. 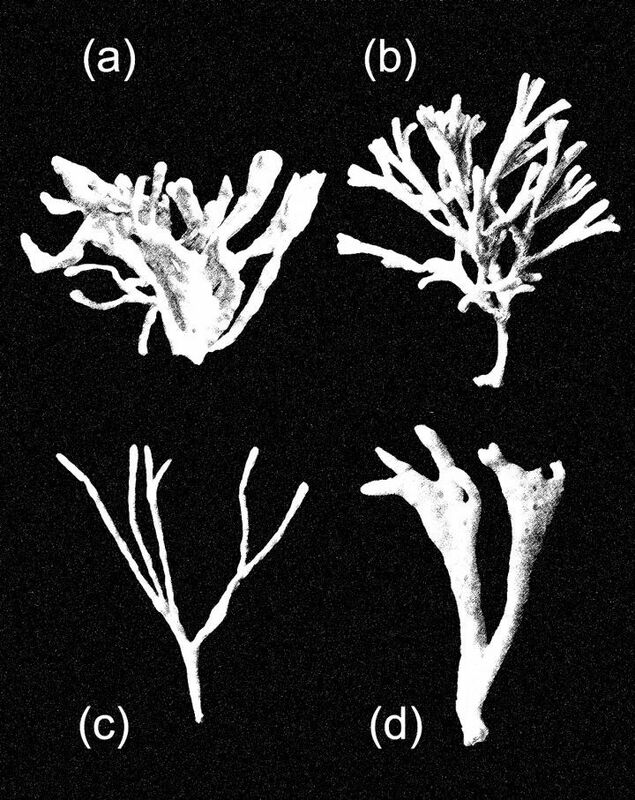 In addition to plants, large taxa in the animal kingdom such as sponges and corals also belong to the category of modular organisms (Fig. 5). Unitary organisation is characteristic of mammals, birds, reptiles, amphibians, fish, insects and molluscs14 . While unitary organisms also possess some degree of plasticity, they cannot undergo fundamental restructuring in response to external environmental influences; modular organisms, on the other hand, can. Figure 5 – Illustration created by Gyula Július on the base of the following source: Kaandorp, J. A.: Fractal Modelling Growth and Form in Biology, (Springer Verlag, Berlin, 1994). Details from Fig. 3.3 and 4.12. To return to human-made structures, most of today’s buildings are made like unitary organisms: they have a predetermined plan which is to be implemented. Small modifications are sometimes possible, but it is not desirable to elicit continuous alterations according to a changing environment. In contrast, the structure of the Corporant is similar to that of a modular organism: it perceives stimuli from the outside world and adjusts its growth according to them. At this point, it is worth clarifying how organisms, through their growth and devel¬opment, adapt to environmental conditions (e.g. high vs. low light, strong or weak wave intensity). The genome encodes the growth rules15 , and these are inherited. A growth rule can be rigid or plastic (environment-dependent). In either case, adaptation is an evolutionary process: mutations arise over generations and are subject to natural selection. In the case of a plastic growth rule, individual responses also contribute to adjustment to the environment, in addition to the process of evolutionary adaptation. Why do individual organisms within the same species differ, one from another? Firstly, there can be genetic differences in the developmental rules. Secondly, individuals may show plastic responses to their actual environment. Thirdly, chance effects may also be considerable (Fig. 6). 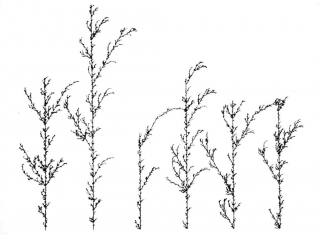 Figure 6 – Prusinkiewicz, P. and Lindenmayer A.: The Algorithmic Beauty of Plants, (Springer Verlag, Berlin, 1990). http://algorithmicbotany.org/. Fig. 1.27. Because of chance effects (stochasticity), each new direction in the Corporant’s development is unique. In addition to random variation, environment-dependent variation is also possible, due to plasticity. It is likely, for example, that Japanese Corporants are more similar to each other than they are to Italian ones, due to climate. Beside geographic location, seasonality and circadian cyclicity can also generate characteristic dynamics – just as in living organisms. In these numeric experiments the creators of the project simulate the ontogenesis of the Corporants. It would be interesting to also simulate their evolution by varying the sets of rules and allowing multiple Corporants to compete for limited resources: we could thus observe the process of adaptation. At present the Corporant only exists in a computer, in silico; its relationship to buildings that are constructed from the materials of the physical world is a question for further studies. What is already worth considering is the nature of its relationship to in vivo creatures – in particular to modular, plastic organisms, such as plants. In adjusting to its environment a plant encounters a number of problems. 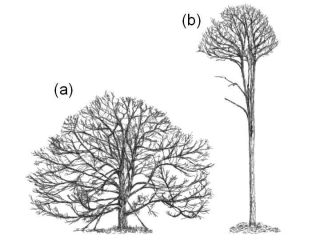 This is, indeed, one of the keys to the morphological diversity of the plant world: during the course of evolution, a number of alternative solutions can exist for the same problem. Resource limitation is one of the major environmental challenges. By resources, we mean both building materials and energy. Of two individuals with similar architecture, the one using fewer resources will have a selective advantage. A visually appealing indication of this economy is the hexagonal branching pattern in some species of plants16,17 : a plane can be most economically filled by a hexagonal grid, since this minimises the linear length of branches. Environmental heterogeneity is also an important selection factor. Almost none of the resources are distributed evenly in the areas occupied by the modules, or in the areas where new modules can be developed. With respect to light, for example, the northern side is different from the southern, and within these relatively sunny and shady patches may occur. During plastic development, it is a matter of “devel-opmental decision” as to which modules are to be maintained and what the new directions for further growth will be. In some species geometrical changes can also take place in response to environmental stimuli18 . The heterogeneous distribution of light and of some other factors can be observed in the case of a Corporant too, as the sensors can detect different intensities of light. Adaptation can occur in a Corporant-type creature if we can assign values to the various intensities of light. For example, we can say that the more light the entire structure can access, the better it is with respect to heating or lighting: thus we can select from different versions according to fitness values. Another important challenge originates not in the outside world, but inside the organism. A plant has its own anatomy and physiology – and, we might add, so does the Corporant. Growth is limited by numerous anatomical and physiological constraints. For example, the plant’s body should be structurally stable at every stage of development, and its branches should not be broken too easily by the wind or by gravity. Transport of material is also important, and needs to be continuously provided during development: within the plant’s body this function is performed by its vascular system. Supposing that a building similar to the Corporant did exist, and that it grew continuously, rearranging its structure: the maintenance of flows – of drinking water, wastewater, and electricity, for instance – would also be a challenge. Another potential selection factor is heat economy, which is also a determinant for both living organisms and buildings. If Corporants were selected on the basis of heat economy, structures emerging in Italy would likely be different from ones emerging in Hungary. (1) The integration and disintegration of modules. Modularity offers a possibility for the organism to be composed of relatively autonomous units. The emphasis is on relatively, however, because the autonomy of the units can change, depending on what is optimal in any given environment. Plants are remarkably flexible in this respect. There are species in which the modules are strongly integrated and thus a significant amount of growth regulators and nutrients move between them; in spite of its modular structure, the individual plant – or a considerable part of it – functions as a single functional unit. In other species, however, the modules become autonomous shortly after their birth, splitting from the “mother” module; these are species that reproduce vegetatively. Thus there can be considerable variation as to which developmental rules are local, regional or global within an individual organism. There are habitat types that select in the direction of integration, while others select towards disintegration19 . Furthermore, the degree of integration can change not only phylogenetically, but also during ontogenesis. It is possible, for example, for an individual organism comprising autonomous modules to reintegrate at the time of flowering, injury, or at the end of the growth season. Thus the size of the functional unit is not fixed. Even a higher level in the hierarchy – a module composed of modules – can emerge within a plant. (2) Specialisation of modules. It can be observed in numerous plant species that modules can be specialised for various functions. For example, some modules allocate more energy to photosynthesis, while others spend more energy in the production of inflorescences20 . This is how the whole set of modules – the genetic individual – can increase the efficiency of total energy use. Partial integration is a condition for specialisation, since in the case of full integration, all modules would be under common control. (3) Change of plasticity. Plasticity – the environment-dependent variability of the individual organism – has not only obvious advantages, but also disadvantages. One of these is the need to maintain a metabolic system that perceives the quality of the environment and can implement a change. In general, plasticity is restricted by a high degree of specialisation, since the possibility for a change in function becomes limited, and so plasticity contradicts point (2) above. A further disadvantage is that an environmental signal is not necessarily reliable: for example, there can be a delay between the signal and the growth response of the plant, and the environment may change in the meantime. Therefore high inducibility is not necessarily an advantage. Plasticity, too, has an optimal degree that is dependent on the actual environment21 . On the one hand environmental challenges, and on the other a wide range of possible responses, have resulted in a high diversity of plant morphologies during phylogenesis. Molecular genetic methods provide increasing support in investigating the process of evolution, and in exploring the history of life on earth. Another exciting area of research is the study of the emergence of ecological communities – usually consisting of species with different growth strategies – and explanation of how different growth patterns can fit together and coexist. This is one of the keys to understanding the organisation of ecosystems and to develop management techniques for their long-term sustainability22 . Having insight into developmental processes and spatial organisation is also important for constructing more efficient and at the same time environment-friendly agro-ecosystems, and for enabling breeders to create growth patterns that are more favourable for use. Perhaps these few examples illustrate that design is often, and in many ways, an issue for biologists as well. The increasing methodological potential for spatial modelling in computers has created an exciting interface between biology and architecture. For example, biology could contribute to collaborative thinking through its involvement in the study of complex, self-organised systems. It is inherent in the biological approach to consider the object being studied as an open system, and thus to take into account interactions with the environment. Ecology is one of the fields within biology in which the interactive nature of processes is particularly emphasised: the environment affects the organism, and the organism can in turn change its environment; thus from the multiplicity of organisms and elements of the abiotic environment higher-level organisational units – ecosystems – can emerge. For me, the most valuable feature of the Corpora Project is its panta rhei approach: the extension of time scale beyond a short, strictly finite period of planning. In this I feel it demonstrates its relevance to the theme of the Venice Bienniale: Beyond Architecture. Although the Corpora Project only presents the transformations of a single virtual structure, it also draws attention to a phenomenon which points beyond: the multiplicity of buildings and other human-made structures forming patterns in the landscape in an environment-dependent manner. The Corpora Project and other related models – including biological ones – open the way for viewing top-down and bottom-up organisational processes in unison. Acknowledgements. I would like to thank Máté Gulyás, Péter Földiák, Viktor Bedő and Erika Katalina Pásztor for their careful review of the manuscript. I am grateful to the International Programme of the Santa Fe Institute (USA) for a research grant during the time I was collecting the material for this essay.